Afghan authorities say a member of the country’s parliament was killed and 11 other people injured when a bomb planted near his Kabul home exploded on June 5. The attack on Sher Wali Wardak, a lawmaker from the eastern Wardak Province, came hours after Taliban militants stormed a court building south of Kabul, killing at least seven people, including a chief prosecutor. Interior Ministry spokesman Sediq Sediqqi said the explosive device was hidden in an electrical box attached to a wall and detonated as Wardak left his home. “It could either have been a bomb on a timer or one that was remotely detonated,” Sediqqi said. 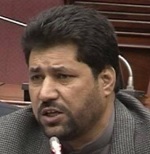 Among the 11 others injured in the blast were five of Wardak’s bodyguards, Sediqqi added. No group had immediately claimed responsibility for the blast on June 5. A member of Afghanistan’s parliament in March survived after he was targeted in a suicide attack that killed three people and wounded eight others.